My family is from New England, a region well known for being thrifty, especially with fish. Cod cheeks are my favorite part of that fish, and halibut cheeks are even better. Cod throats and collars are not uncommon menu items in Massachusetts, although sadly they’re becoming moreso because of overfishing. Collar, you say? Yes, collar. It’s more or less what you think it is: The meaty bit of a fish behind the gills and before the first slice of the fillet. And I am here to tell you that you need to master this cut, because it produces the best part of the fish. I am not joking. The collar is fatty, even on lean fish, and has several contrasting textures of meat to get into. And when grilled, the skin gets all crispy and the ends of the fins char a bit, breaking down the strength of the bones within them so you can nibble on them like chips; they taste surprisingly nutty. 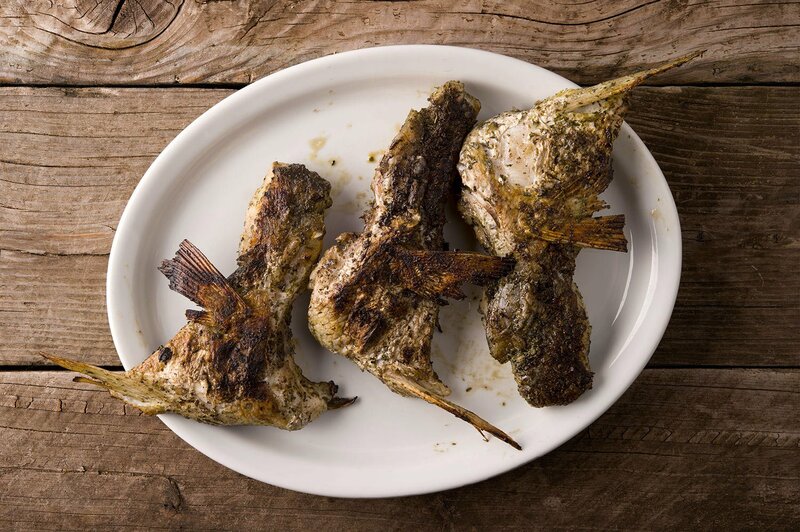 If you’ve ever been to a sushi restaurant and seen hamachi kama, this is grilled yellowtail collar. Order it and you will soon see I am right about fish collars. But how to get one? First, you need a large fish. Not tuna size, although that would be hilarious: A gigantic collar over a huge fire, roasting away for all to pick at. Maybe on a lazy susan with various dipping sauces. (Filing this idea away for later.) No, I mean a “normal” big fish, like 10 pounds or larger. To remove the fish collar, remove the gills and gut the fish as normal. Now make your fillets, but be sure to cut straight across (perpendicular to the spine) from about 1/2 to 1 inch behind the pectoral (side) fin. What that does is a) give you a nice, triangular fillet that avoids the weird pointy bit you get from behind the back of the fish’s head, and b) leaves more meat for the collar. To get the collar, take your knife and slice just over the backbone toward where the gills used to be to cut through any pin bones. Good kitchen shears work well for this, too. Now cut straight down behind the fish’s head where bone meets meat (cut through the meat) until you get to the middle of the fish. That should free the collar for the most part, although you might need to snip here and there where things are sticking. When you’re done, you’ll get a piece of meat that looks like the state of Minnesota. How to cook it? Grilling or slow smoking are the ways to go. 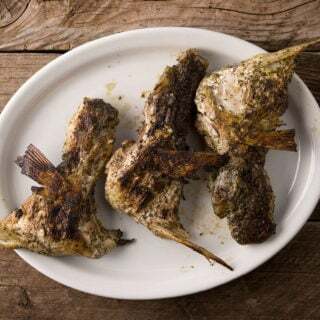 Grilling hot and fast is normally what I do — thus this recipe — but with fatty collars from trout, salmon and sablefish I will also smoke them. Smoking is better for fattier fish in general, I find, because smoke adheres better to fat than lean. 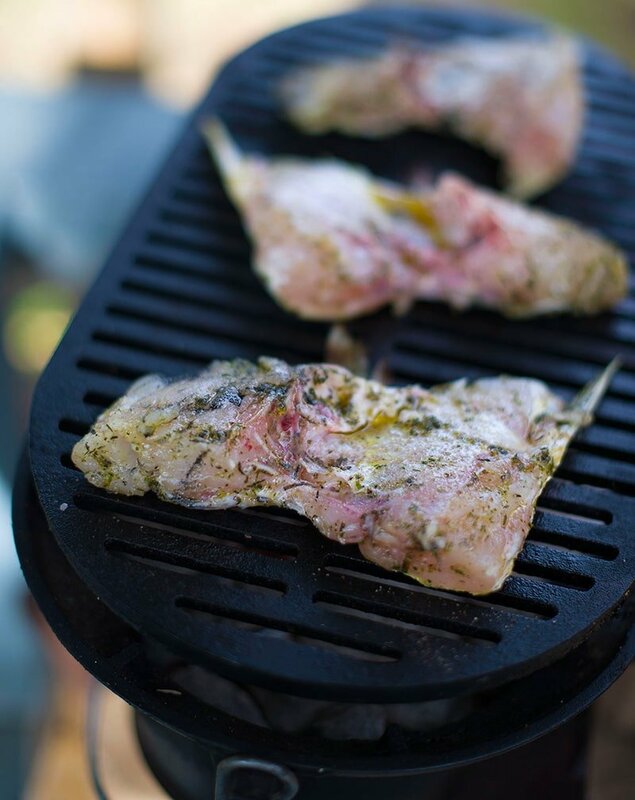 Whatever fish you use, cook them simply and enjoy the kaleidoscope of texture and flavor you get from this largely unloved portion of your catch. Serve these simply, with maybe some grilled vegetables and potatoes, or with some bread. To drink, something uncomplicated, like a lager or pilsner beer or a nice but not-too-fancy white. A dry rosé is another good choice. If you have leftovers, flake out the meat and use it for a fish salad the next day. You can use the collar from any large fish here. Some good candidates include: striped bass, salmon, lake trout, redfish, tautog, yellowtail, white seabass, really big Pacific rockfish or largemouth bass, lingcod, snapper or grouper, and sablefish, also known as black cod. The fattier the fish, the shorter the marinade. I often marinate collars from salmon or lake trout only a few minutes. I also really like to grill salmon collars Japanese style; this method also works great for yellowtail. Put the collars in heavy duty freezer bags and add all the remaining ingredients save the lemon wedges. Seal the bags and shake them around to coat the collars well. Marinate in the fridge at least 1 hour and up to overnight. Get your grill nice and hot and clean the grates. Arrange the collars skin side up in one layer so they don't touch. Grill over high heat with the grill cover open until charred a little, about 5 minutes or so. Turn and do the same to the other side. If the meat's not cooked through (it will start to flake), give it a little more time. Serve hot with lemon wedges and a bowl to toss the various bits of bone and fin. I do long range trips out of San Diego and have smoked several collars from 100+ pound yellowfin tuna. Just a light rub of olive oil, salt, and pepper. Absolutely amazing.